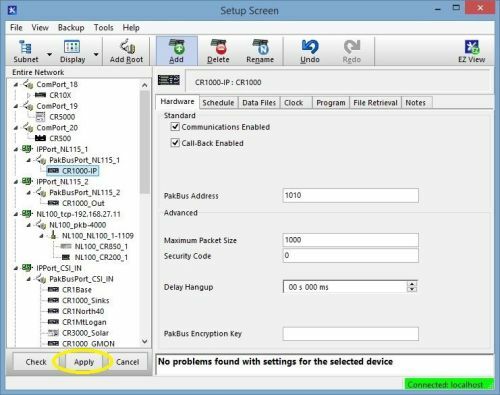 Configuring a network of data loggers for communication and data collection in LoggerNet's Setup window can seem like an arduous and tedious task, but it doesn’t have to be. 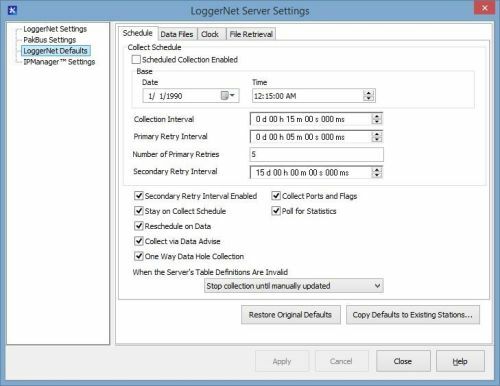 It’s true that you need to complete this task before you can use LoggerNet to connect to a data logger, send a program, set the clock, or collect data. However, there is a way to save yourself a lot of time, especially if the settings required for your system (such as data file location or scheduled data collection interval) are not the same as LoggerNet's default values. In the Setup window's Tools menu, select LoggerNet Server Settings. On the left side of that window, click the item named LoggerNet Defaults. The window shown below is displayed. You'll notice that this set of tabbed windows—Schedule, Data Files, Clock, and File Retrieval—looks like the Setup window's options. Note: After you've made and applied changes, each new data logger added to the Setup window will use the new default values. Click the Copy Defaults to Existing Stations button. In the left column, select those settings you wish to copy. In the right column, select the stations you wish to copy the default settings to. Tip: Keep in mind that not all settings apply to all data loggers. 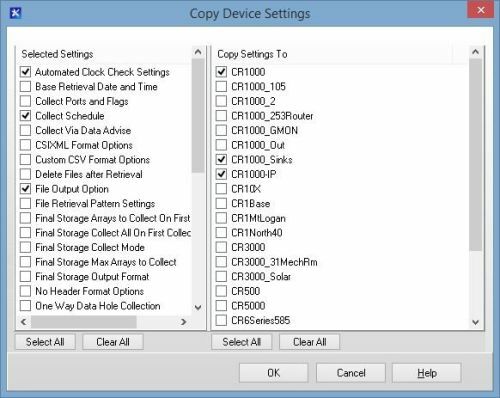 For instance, Final Storage settings are relevant to mixed-array data loggers (for example, the CR10X, CR23X), but not to table-based data loggers (such as the CR1000, CR3000). If you have questions about any setting, position your cursor within the field for the setting and press the F1 button on your keyboard. This will open the help information for the selected setting. I hope you have found this tip on changing LoggerNet's default settings useful. Do you have another time-consuming task that we might be able to help with? Leave a comment below and tell us about it!